Internships are an integral part of the marketing program at Indiana State University. Students are encouraged to gain practical hands-on experience by participating in an internship or co-op-related work experience with a business, service organization, or government agency. 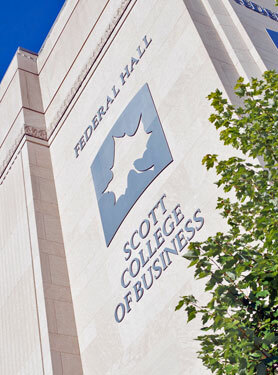 The University's Professional Practice Program, offered through the ISU Career Center, is a source of potential internship leads, and the Scott College of Business' Meis Student Development Center serves as a valuable resource for business students seeking professional development and experiential learning opportunities. Internships approved by the Department of Marketing also can earn credit toward completion of the degree.